FXTM, a well-known broker authorized by the IFSC, FCA and CySEC, is granting a magnificent ‘Switch to FXTM with $30 Gratitude’ to all the new registered clients who switch to FXTM from their old broker. The FXTM offers top-notch trading conditions including flexible spreads, high speed, and more than 250 trading instruments (CFDs, Futures, etc.) suitable to your needs. It’s time to choose wisely, join the program and reap the benefits! The clients are to register a Live Trading Account with the FXTM and make the minimum deposit of $150 in the next 30 days to receive the bonus. The traders can trade with CFDs, Forex, Metals and Commodity Futures; however, this does not include CFDs on shares. Moreover, the MT4 Standard, Cent, MT5 ECN, ECN Zero, and MT4 ECN except PAMM Program are acceptable for this promotion. All the available funds including the profits are withdrawable after trading at least one standard lot. For joining the FXTM Company and receiving the bonus you’d have to register a Live Trading Account (with verifiable info) and consent to the terms and conditions. When you are verified, fund your account with the at least $150 (or its equivalent) during the next 30 days. Afterward, the bonus will be transferred within 24 hours to your live trading account, and you can begin trading. The traders who wish to participate in this program should not be involved in any other promotional activities. The bonus amount is for trading purposes only. In this program, only the positions that remain open for more than five minutes will be calculated. The promotion is offered once per clients, and internal transfers are not accepted as a deposit. 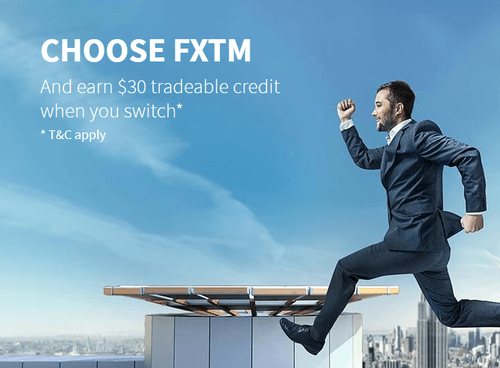 Get FXTM $30 Deposit Bonus Now!